Materials is a new commodities app designed to make commodity tracking more intuitive, extremely efficient and essentially beautiful. The easiest and most beautiful way to track commodities. Put commodities at your command. Whether you go to Wall St, the Chicago Merc or any online commodities forum, commodities traders will all tell you the same thing: the apps designed to track them are poorly designed, hard to use and don’t offer nearly enough features. Now available for iOS, Materials is a new commodities app set out to reimagine commodity tracking from the ground up. Materials is purposefully designed to make commodity tracking more intuitive, efficient and aesthetically pleasing than any other commodities app available. Materials gives commodity trackers a host of features no other commodities app offers. Users of Materials are able to tailor their experience by creating custom price alerts based on opening price, closing price as well as intra-day price fluctuations. In addition to virtually instant price information, Materials also delivers the latest commodity specific news, updates and more to the palm of your hand. 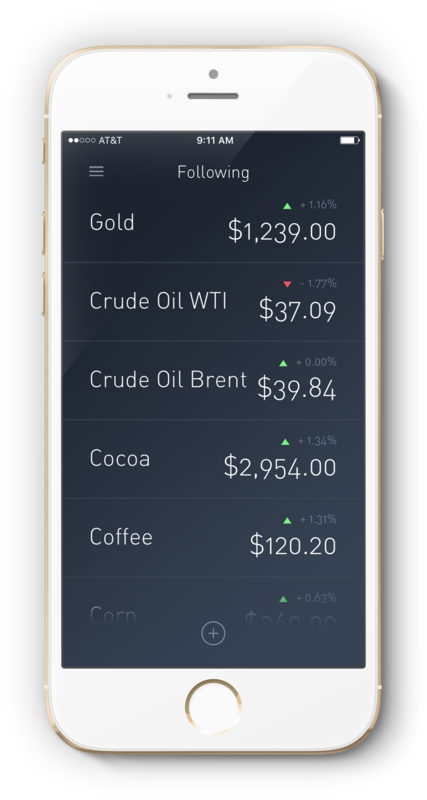 More than that, Materials is the only commodities app that offers the ability to receive instant push notifications—ensuring you’re the first to know about important commodity price changes and alerts. Materials also includes an Apple Watch app, making it easier to see snapshots of current day prices and other relevant information. Materials is now available for iOS at the App Store. For more information about the Materials app visit onlymaterials.com.